Recently I made some purchases from COMC and I tend to bundle when I do so. I try to turn a 1-2 card pickup into a good 8-10 minimum. Now because I was having a fellow collector pick them up on my behalf, I knew that he would likely be adding to the mix. He had his latest order shipped off which meant I would be receiving some cards soon. And it was exciting to see the bubble envelope in the mailbox. 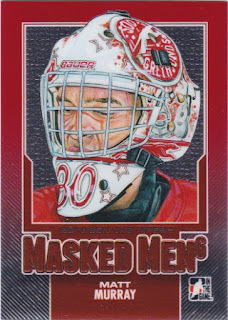 In addition to some Lindens and Gambles, I picked up a few goalie mask cards....even going so far as finishing off a set. I thought that the line between the asking price and my finishing up a set was right along where I was willing to walk. Hey, when you're three cards away you tend to see that light at the end of the tunnel get even brighter. 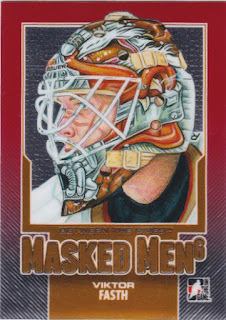 Masked Men 6 was the most recent goalie mask set to be produced and one that I chased pretty well locally at a few card shows until the well dried up. Not too many guys have these sitting in their trade box anymore. This Matt Murray was the trigger for me completing the set when I did as I thought it was sitting at a good price (considering he just won a Stanley Cup and is likely to dethrone Marc Andre Fleury as the number one guy in Pittsburgh) and so I grabbed it quick. Looking at the remaining two cards on my list, I wondered why I didn't already have them, but then I quickly rectified that conundrum. 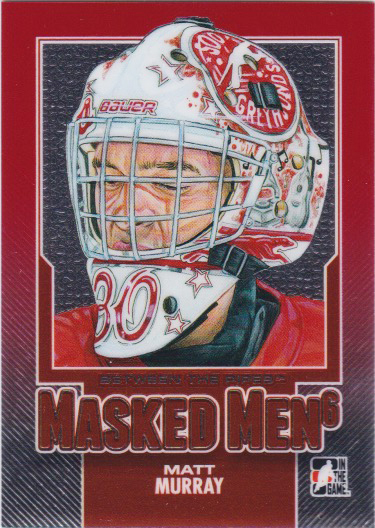 The last of the vintage guys in this set, Steve Baker's mask is a mix of bold simplicity and team/city inspiration. I really like the old fibreglass offerings for their more straight forward designs that can be appreciated from afar. 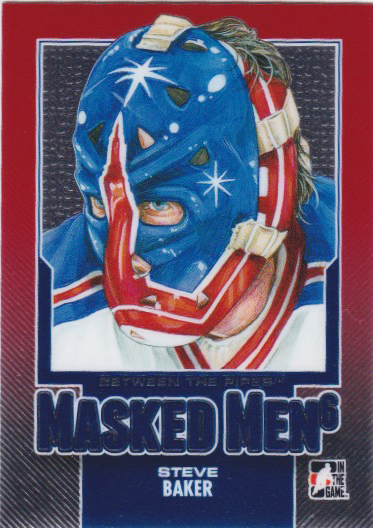 The Empire State Building sitting in the middle of the mask really gives it an obvious symmetry and produces that brilliant offset of red on blue. So effective. As you can see, the intricate detail on this mask just gets lost in the overall presentation. What is it that I'm looking at? I've been looking at it now for a couple minutes and I still can't make it out. A quick internet search shows that this is the Mr. Bane Duck mask. Inspired by the Batman villain. 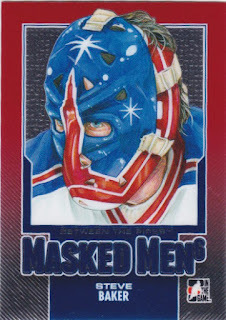 This card finishes off the Masked Men 6 project which leaves a bit of room on the wantlist for an upcoming Masked Men set being released by Leaf. I only hope that they do the goalie mask thing justice and not try to create some 'scarcity' product. As I mentioned, when I browse on COMC I tend to buy in bulk. 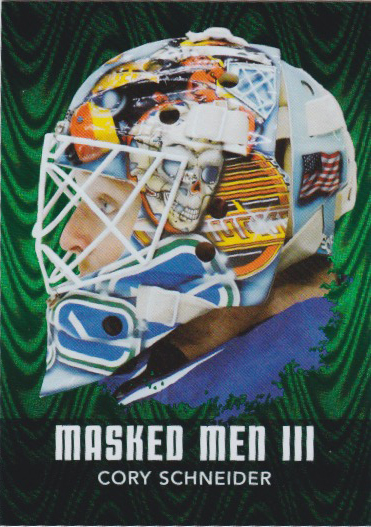 This ex-Canuck mask card was sitting at the right price and so I figured I'd cross it off the list at the same time. It's a great homage to past Vancouver masks (Bromley, Garrett, McLean...just from what can be seen on this one side)...I only wish the Nucks still had Cory tending the pipes. What a mess they've made of the goalie position in recent years. Still leaves me with a couple left on the wantlist from this set (Luongo and Giguere) but I am in no rush to pick those up for a price higher than I want to pay. I do think I'll be knocking them off the list sooner than later...after all, it's been six years now. The accomplishment of completing a set might not be what it once used to be but I still like to sift through the cards to see the end result. Lots of fun. Thankfully I have him already.